I spend much of my day at a computer. I think my longest stretch without getting out of my chair was about ten hours. I’m one of those people you have to force outside during the week. Can anyone relate? The funny thing is when I step outside, I instantly feel better (weather not withstanding). I breathe deeper in sunlight. I smile more outdoors. And yet, one of the most challenging parts of my day is getting enough fresh air. So here’s today’s pledge for myself: Today, I will take a walk to nowhere for a few minutes. So on that note, here’s to you and I getting outside and seeing the world—whether it’s our backyard, our neighborhood, a favorite trail, or even a nearby farmer’s market. And why not nourish along the way? Mix together all ingredients in a paper bag and shake until combined. Divide evenly into 4 Ziploc style snack bags. 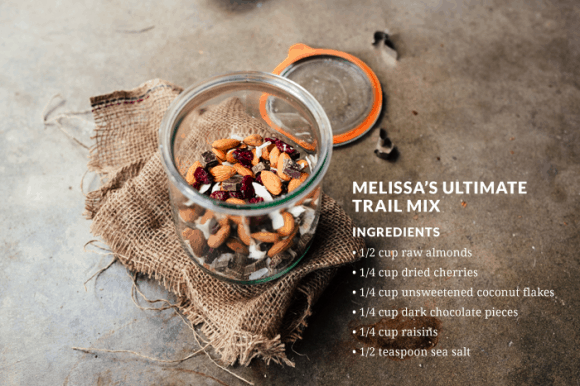 For 21 Healthier Trail Mix ideas. 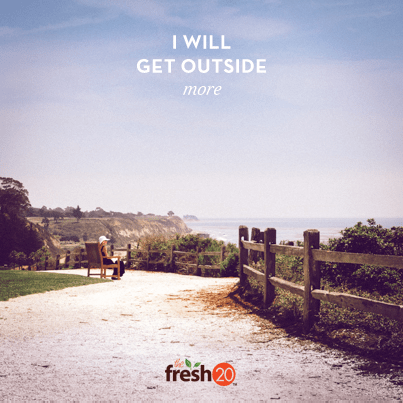 PLEDGE QUESTION: How will you get outside?